The rifle represented on this page is a .22RF sleeved barrel conversion of the .303 Pattern '14 (P'14) rifle. 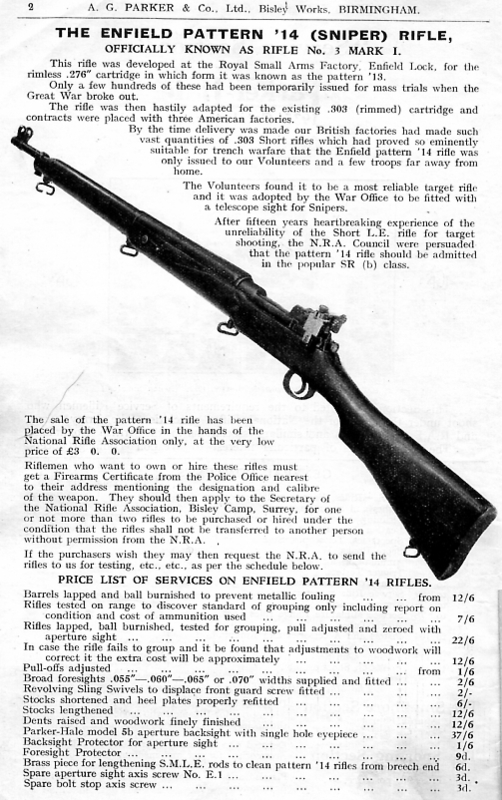 The P'14 was a 1914-18 wartime expediency version of the Pattern '13 rifle originally Enfield designed in .276 calibre, trialled, but never put into production. The rifle was also adopted by the U.S. military as the Pattern '17 ( P'17 or M1917 ) in .30-06 calibre. It was manufactured by the Winchester, Remington and Eddystone companies. The volley sights of this No.3 Mk.I* rifle have been removed - in common with most rifles re-issued in the 1939-45 War. The .22 calibre Parker-Rifled sleeve protrudes into the receiver to meet the P'14 bolthead recess base originally machined for the rimmed .303 service cartridge. 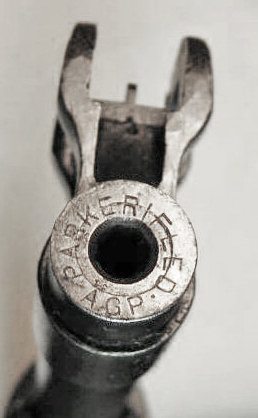 Below can be seen the bolt-head face, more deeply recessed near its outer diameter than originally for the rimmed .303 cartridge-case head (this was already modifiied from the 30.06 U.S. Pattern '17 rifle which used a rimless case), and further recessed for the .22 rimfire rimmed case. 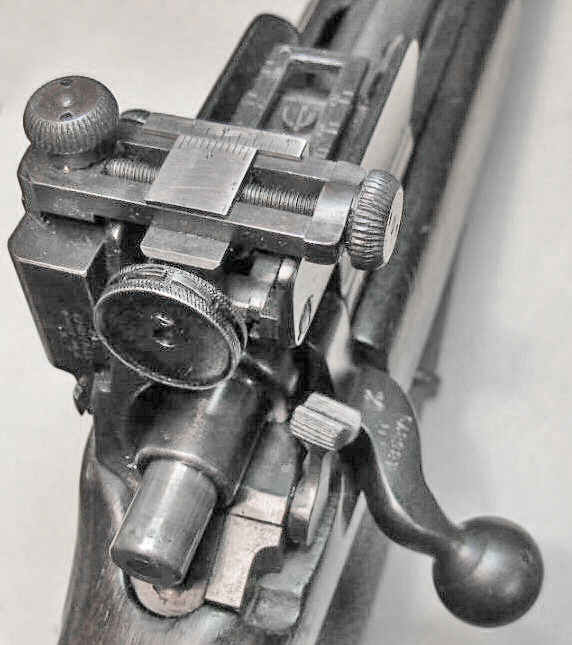 The off-centre firing pin hole can also clearly be seen; this comes to a position at the bottom of the bolt-head when the bolt handle is rotated and the breech closed. 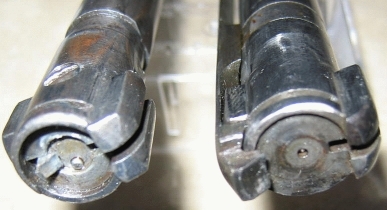 Below left is the front of the receiver of a .303 P'14 rifle; to its right is the .22RF modified receiver. It can be seen that over half-an-inch of the bolt-head shrouding section has been cut away - almost up to the gas vent. The bolt body has had the .303 extractor - with its integral extraction claw - removed along with the extractor ring. A narrower .22RF extractor lever has been fitted inside the bolt lug; a very neat and effective conversion. available, special barrels, sights, and a host of ancillary equipment. Above, a Parker's six-hole - variable aperture - rotating disc eye-piece is fitted to the 5B rear-sight. Calibration of the 5B sight on the Pattern '14 is for the Mk. VII .303 round. Not relevant with the .22RF cartridge. There is no provision for small-bore use other than the option of the minute-of-angle scale on the LHS. After the barrel had been bored to the sleeve outer diameter clearance size, the sleeve was normally soft soldered into the barrel, sometimes with an olive at the crown, not evident in this image. 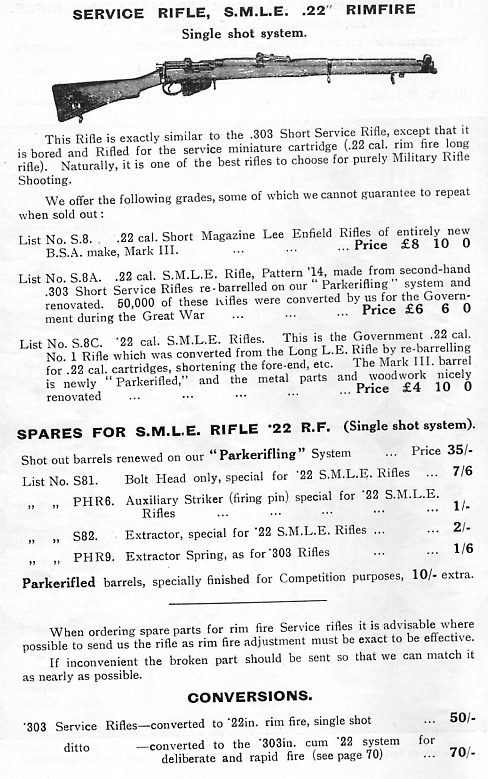 Above right, is an advertisement from the 1935 catalogue of A.G. Parker first illustrating the .22RF P'14 conversion alongside their more common SMLE conversions. The P'14 falls midway between the economy SMLE option and the brand new BSA .22RF SMLE - which was fitted with a specially manufactured solid barrel. Below in a video clip is a British Pathe Newsreel of Enfield rifles shown in training. Should Internet Explorer be causing difficulty in viewing, please check your firewall settings, or perhaps bear in mind Mozilla "Firefox" as an alternative browser. From the February 2001 issue, pages 33 - 44. In the aftermath of the First World War, the Birmingham Small Arms Company, BSA, acquired the rights to broker sales of all surplus British small arms and ammunition. The material consisted of what was considered non standard or unserviceable for various reasons or unlikely to be of future operational use. The biggest single item was the large stock of Pattern 14 rifle in .303 calibre. Marketing these rifles was difficult as the calibre was in wide use only by the British Empire, Estonia and Latvia. After the Bolshevik Revolution in Russia, the British supplied Ross and Pattern 14 rifles from Royal Navy stocks to these Baltic nations. During the Allied Intervention in the Russian Civil War, they supplied large numbers of rifles to the "White"anti - communist forces. The Black Sea port of Novorossisk was HQ of the "Denmiss", the British mission sent to supply the White "Armed Forces of South Russia". From March 1919 onward, they supplied about 200,000 rifles to Deniken's forces including large numbers of Pattern 14, lesser numbers of Ross M10 and fewer numbers of Mk.3 and Mk.3* Lee Enfields in .303. Pattern 14 rifles from British Army stocks were provided to other White Russian forces elsewhere in the former Russian Empire during this period. During the 1920's, the surplus German Mausers in 7.92x57mm were the preferred rifles in the international arms trade. 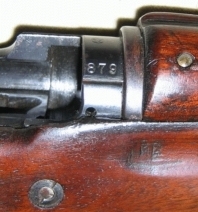 Finland sought to buy or trade for Mosin Nagants and attempted to standardize on this type. The warlords in China were always seeking to buy surplus rifles. The Soley Armament Company was established near Regents Park in London by a former RFC officer, John Ball sometime in the mid 1920's. At a later date, Ball established a partnership with Edgard Grimard, a dealer located in Liege, Belgium. They formed the firm of Soley Grimard & Company to convert Pattern 14 rifles to the desirable 7.92x57mm used by many nations in their Mauser rifles. They believed that these rebuilt rifles would find a place on the market. In 1930, BSA subcontracted their franchise for War Ministry surplus small arms to Ball. From the outbreak of the Spanish Civil War in mid July, officials and agents of the republican government and also of individual factions of the Red coalition attempted to arrange arms deals through various intermediaries and dealers, chiefly from Paris. They unknowingly competed with one another and sometimes with Krivitsky's operation, driving prices up. Poland had won its independence following WW1 and established its eastern border after defeating the Red Army in the Russo-Polish War. She was caught between two major powers, Germany and Soviet Russia, both of whom had territorial claims on her border areas. She also had a dispute with Lithuania over the city of Vilnius. She had to maintain strong-armed forces to survive. Upon establishing independence, Poland was armed with various foreign rifles. Poles had served in three armies during the Great War. Imperial Russian, Imperial Austro Hungarian and French. From Germany, she received the machinery from Danzig Arsenal to produce the Mauser Gewehr 98 and Karabiner 98AZ. From France, she had received M86/93 Lebel and Mannlicher Berthier M07, M07/15 and M16 rifles and carbines. From Austro Hungary, she had Mannlicher M88/90 and M1895 rifles and carbines, as well as a few M1903/14 6.5mm Mannlicher Schonauer rifles. From Russia, Imperial and Soviet, she had M1891 Mosin Nagants of all types, including some captured/reissue types in 8x50mm. She also had some .303 Pattern 14 Enfields, which had either been given as British aid or captured from the Soviets. The Mauser was selected as the standard rifle type and existing rifles of this type were reworked and copies of the German gew.98 and Kar.98AZ were produced at arsenals established at Radom and Warsaw. Minor variations were produced, but are beyond the scope of this article. In 1929, a new short rifle version of the Mauser, seemingly based on the Czechoslovak VZ24 made at the ZB rifle factory in Brno, Moravia, was adopted. The infantry version had a horizontal bolt handle and the cavalry rifle had a turned down bolt handle. 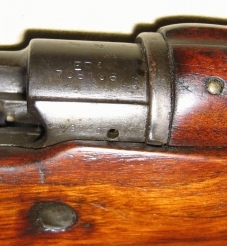 The Poles used many second hand and refurbished parts in their rifle production. The Poles traded for and purchased used Mausers on the world arms market. In the early 1930's, they bought a lot of reworked Mausers in 7.92x57mm from Soley Grimard & Co. in Liege. 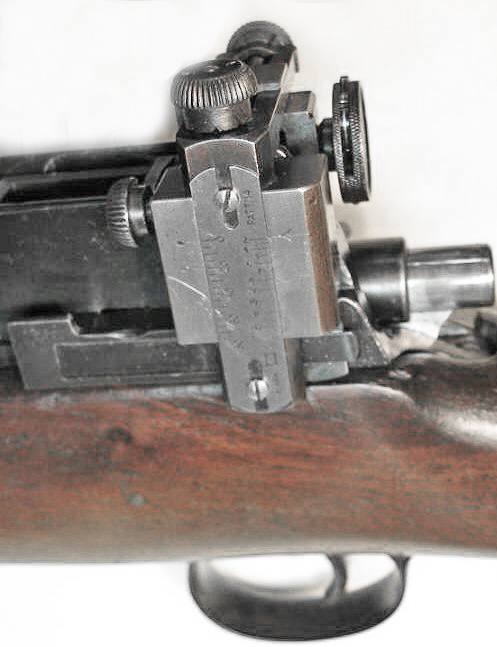 The secondary official standard rifle was the Mosin Nagant Model 91/98/25 in 7.92x57mm. These were made by reworking captured stocks of Mosins in 7.62x54R by commercial firms in Poland in the 1920's. All the other rifles on hand were considered surplus as soon as new Mausers could replace them. In 1926, a front company was established by War Ministry to handle sales of surplus war material and later it evolved into a full scale weapons dealership, buying, selling and trading. It was known as the "Syndicate", SEPEWE for the initials of its Polish name, or in English "War Material Export Organization".